You love fishing. Spending a long and peaceful day on the water with a cold beer and your fishing rod sounds like the perfect day. You also love getting a great full body workout on your SUP. Combining the two sounds great but, first you need to get your hands on some accessories. Why not combine your two loves and take your paddle boarding experience one step further by loading a cooler and you tackle box? 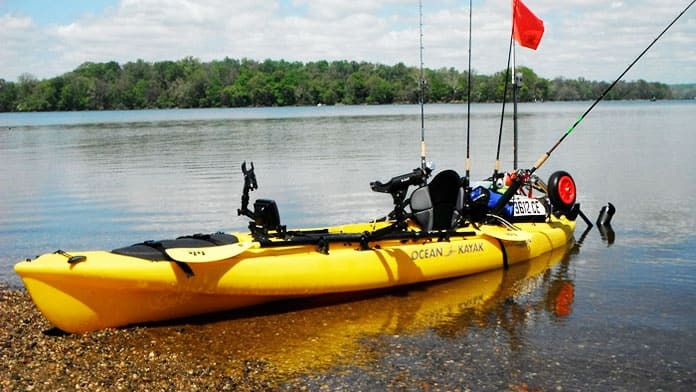 This idea has taken off in the SUP world and more people are looking for the best sup fishing accessories. We have done some research and come up with our favorites. You never know when a breeze may come and the water will get choppy. Having dry bags to throw your gear into will give you peace of mind that your day on the lake will be enjoyable. 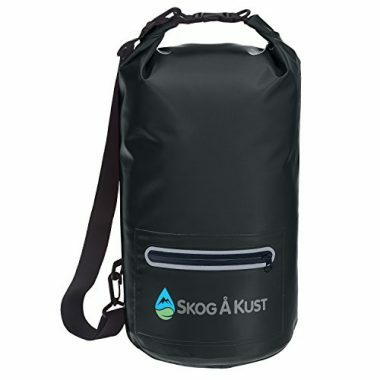 Being completely waterproof, this dry bag even comes with an exterior zippered pocket. The welded seams ensure absolutely no water will come in contact with your belongings no matter where your adventure takes you. The adjustable shoulder strap will ensure your bag stays with you even if you have to swim or hike to your perfect spot. The Såk waterproof dry bag allows you to have your camera with you to snap a photo of the fish you catch while fishing on your sup. 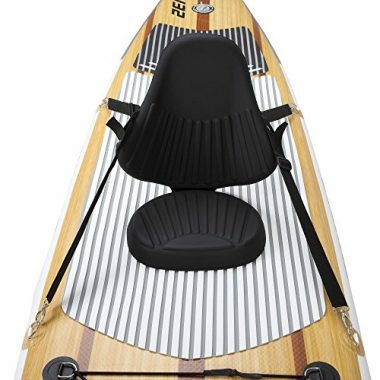 Add versatility to your board by adding a seat and turning it into a kayak style. While it may have been designed for use with THURSO SURF brand sups, if your board has D rings on it, this seat will be compatible. With four simple straps, you have a seat back that is able to hold your weight and provide support on your long fishing trips. Incredibly lightweight and durable this seat rest can comfortably hold 200+ lbs. This is one of those stand-up paddle board fishing accessories that extends so much further than just fishing use. Use it for long distance paddles when your legs get tired or for a mid lake picnic. The opportunities are endless. No fishing trip would be complete without a rod mount. It is fun holding a rod and waiting for that bite, but after a while, it can become tiring. A rod holder will hold your rod for you so that you can maneuver your board or have a bite to eat. The compact design of this rod holder means that it will keep a low profile on your board while accommodating all types of rods (long or short). We love how much you can adjust this rod to get the perfect fit and position. There is also a safety strap included to ensure that your rod is never lost. When you are out on the water, especially when the water is calm and flat, the glare from the sun is intensified, and on particularly clear days, the glare can really distract you from your fishing adventure. 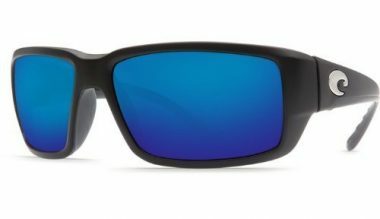 These sunglasses are polarized to reduce that glare, giving you a clear field of vision. These sunglasses are also extremely lightweight, meaning that you will hardly feel them when they are on your face, and incredibly stylish, leaving you looking and feeling great. This cooler is just the right size for a paddleboard. 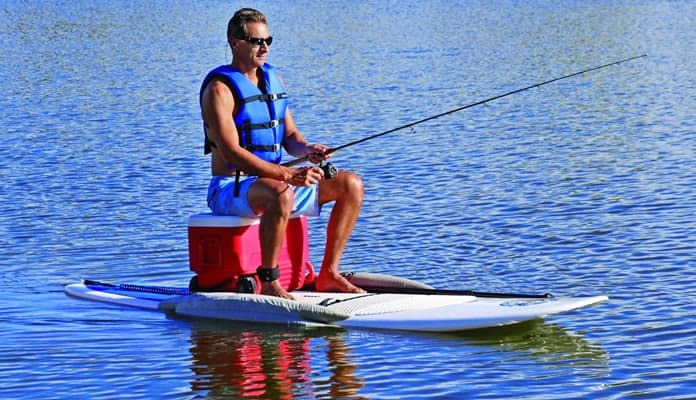 When you are out fishing from your paddleboard, there is not a whole lot of room, but this cooler will fit easily, and you will be glad that you brought it with you. The temperature-reflective mylar and foam insulation ket the heat out and the cold in, keeping your food and drinks chilled for the duration of your excursion. The inner liner is made of urethane, which means that liquids will not escape. The liner is also extremely easy to clean. The hook and loop system also makes it easy to remove from your paddleboard. The nylon outer will keep this cooler protected while the urethane-coated bottom adds extra durability. You don’t want to have to worry about your board floating all over the lake when you attach this anchor to it. Great when fishing in groups, this anchor system stretches 25 ft allowing you to get a good distance away from the shore but also allows you to stay close by friends. This anchor will help keep you stable for your sup fishing setup. 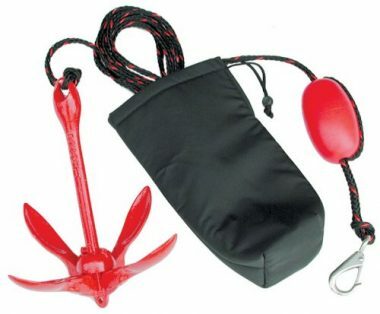 Sure to keep you grounded in mud, sand, gravel and rock this anchor comes with a small nylon bag for compatibility. As an added bonus, it measures in at only 3.3 lbs. When you are out fishing on your paddleboard, you need somewhere to store your gear. This cargo net gives you an easy way to store your small items, such as your jacket or shoes. We like that you have two attachment options. One is more permanent, and the other is temporary. There are suction cups which can be used to attach the net to any part of the board. You also have 3M adhesive to attach the hooks permanently. We like the flexibility on offer with the attachment methods. We love that this storage option is lightweight. Sometimes you do not want to add heavy cargo to your setup, especially when you are using a paddleboard. 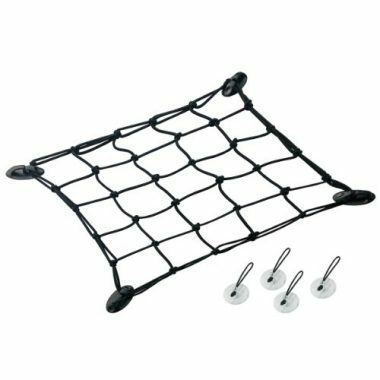 This net gives you some extra storage which not weighing down your board. One of our favorite sup accessories for fishing, this Weighing in at 0.3 ounces this case won’t weigh you down. Mount the peel and stick anchors to your board and simply slide the case on top. This makes transporting your SUP a breeze and allows you to set up your carrying case quickly. 11” of PVC piping are on the sides to hold your fishing rod. This case even comes with a place to hold your paddle. 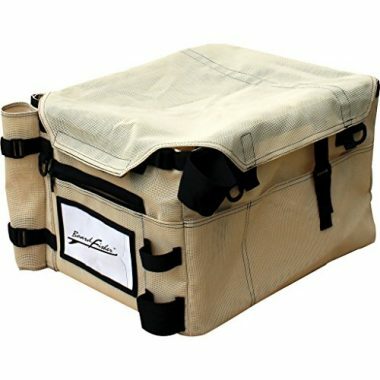 Plenty of pockets boasts even more storage throughout the case allowing you to bring even more on your fishing adventure. When you are out on the water, it is imported to remain covered and protected from the sun. This classic t-shirt looks amazing and will fit any style. It is also extremely comfortable. There is mesh in the underarm to add breathability to the shirt. The fabric is also anti-microbial to keep you smelling your best. The cooling technology will also keep you comfortable, taking care of any sweat or water splashes. 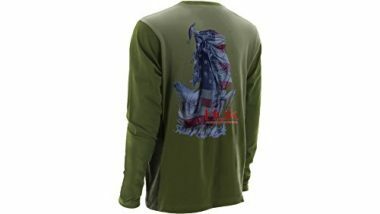 This is a great item of clothing for someone who wants something a little different. The in-built technology will keep you feeling fresh, and the design will keep you looking great. Ever wanted to make your paddle board more stable? Maybe you are fishing and trying to throw the perfect cast. Well, the Airhead Ahsup stabilizer set does just that. 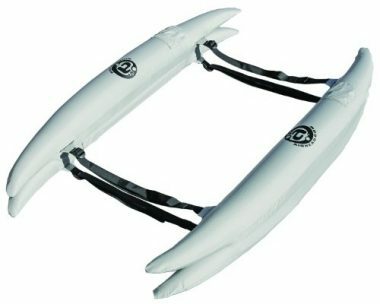 It works by attaching two sets of straps around your board that has inflatable bladders that make your board float perfectly in the water. No matter where you stand on your board it will not move around. The two bladders are made out of a tough PVC material that is covered in nylon. This creates an extremely durable system that will stand the test of time. The adjustable straps wrap around any sized board, making this a must have in your sup fishing gear arsenal. 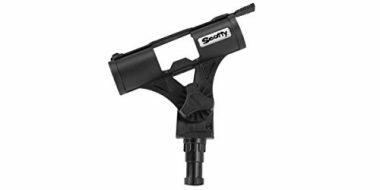 A lot of people will look down a list of accessories for any water sport and begin picking out the ones which they like. In our experience, this can be a recipe for disaster. The first thing you should be doing is thinking about the type of paddleboard fishing you are going to be doing. Where are you going to fish? What is the water like? What are the conditions going to be like? What time of day are you going? What type of fish are you catching? Are you doing this for fun? Or to eat? There are many questions which you can ask yourself to get an idea of your needs. It is only once you have figured out what you need that you can figure out which accessories you should buy. You do not want to spend needlessly. 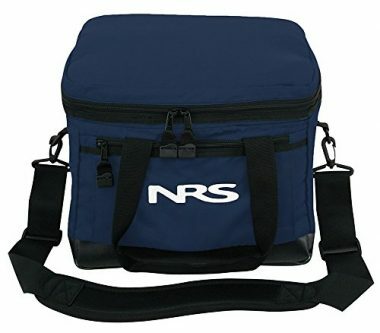 You may think that a cooler is a good idea, but if you are staying close to the shore the whole time, then a large regular cooler may be better. If you are catching your fish on a camping trip to eat them, then you may not be on the water long enough to need a rod holder. If you suffer from sore legs, then a seat may be a necessity. If you are primarily fishing in calm waters, then waterproof accessories will not be as important. For choppier water, waterproofing will be important. When you are paddleboard fishing, you cannot take a lot of accessories with you. It is a good idea to start with your needs and fill them before you purchase luxury items. The size of your accessory will play a big part in your decision making. 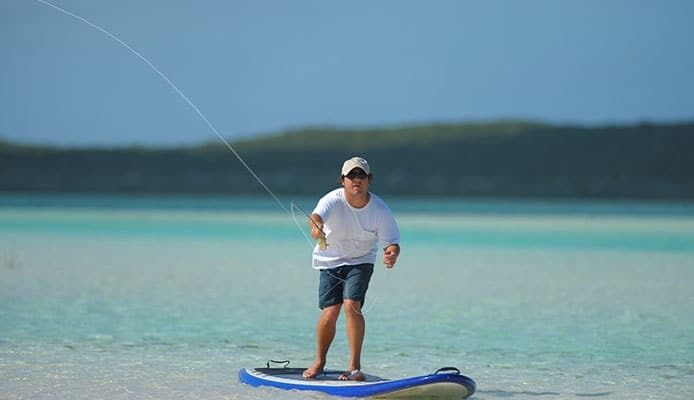 Paddleboard fishing differs from many other types of fishing in that you cannot take a lot of equipment with you. In fact, you cannot take much equipment at all. If you have not yet bought a board, then you may want to consider the size of board you buy before you start buying accessories. If you find that your board is too small, then you can always upgrade. For basic fishing, you will not need to take a lot of equipment, but the more experienced you become, the more you will want to take. We recommend looking for the smallest items in their respective categories while still having an eye on the quality of the item. The less cluttered your board is, the more relaxed you will be on your trip. There are a number of ways in which your accessory will attach to your board. One of your main decisions will be between permanent and temporary mounts. You will want to use permanent mounts for things such as rod holders while cargo nets can be attached temporarily. You do not want to be changing the position of permanent mounts often as you can weaken your board so make sure that you have an accessory in place before you permanently attach it. You can always attach mounts temporarily to get an idea of how they feel in the water before you make a permanent addition to your board. When you are attaching items to your board, always have an eye on the future. Does the position of the accessory leave room for other accessories in the future? You cannot add a lot to a paddleboard so make sure to be economical and smart with your accessories. Q: What Is The Best Accessory For Paddle Board Fishing? A: That is a hard question to answer, and a lot of the decision will rest with the individual and the type of fishing they intend to do. 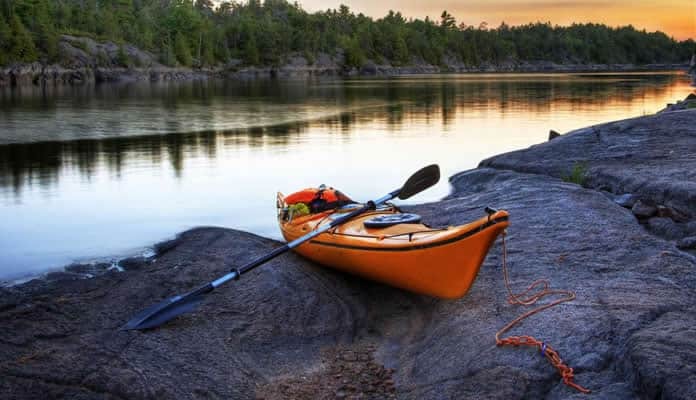 When you are planning a paddleboard fishing trip, it is important to pack as lightly as possible, and with that in mind, we have our top 2 must have paddleboard fishing accessories. These two items are two we always have on our fishing trips, and, while we often bring many more accessories than just these two, we could go without the others if we had to. We always take a cooler with us on our fishing trip. Not only do we love to have a cool drink and some food with us, but a cooler is a great place to store the fish which you catch (after you have removed the food and drink, of course). Our second must-have is a rod holder. Fishing is a meditative experience, and you should not plan to be out on the water for anything less than two hour. Holding a rod is fun, but it is almost impossible to do for any length of time. A good rod holder will stop you from becoming fatigued and will make the trip more relaxing. Take these two items with you and your fishing trip will always be a good one. Q: How Expensive Is a Good Accessory? A: There is no set price for any accessory, and we would never put a price on the item you are after. The only thing which we would recommend is setting a budget and sticking to it, but also recognizing that you get what you pay for. There is no point in buying the cheapest accessory you can find to save yourself some money, only for it to fall apart a few weeks later. Our recommendation is to always spend a little more to get an item which is higher-quality and one which will last you for a long time. It is better to save up for one quality item than to buy multiple cheap items. Having said all of that, you can save yourself some money by shopping around for the best deal. Of course, we have already done that, so an item from our list is not only a high-quality item, but it is at a price which you will find hard to beat. Q: How To Determine A Quality Paddle Board Fishing Accessory? A: There are a few things which you can look at to determine whether a fishing accessory is high-quality or not. The first is the materials which it is made from. You are going to be spending your time in the water, so you should find materials which can hold up to the water, especially the salt water. Aluminum is lightweight and strong. For larger items with handles look for aluminum. You should also be looking for materials such as urethane, PVD, vinyl, silicone, and polyurethane. We could go on with the list, but if you have an accessory made from one of these materials, you should be fine. If you are ever in doubt, then a quick search online will tell you about the material. The other thing you can do is to buy your material from a trusted company. If you look for a dedicated watersports brand, then you know that you will be getting a quality item. The last thing to do is to look at the customer reviews. Most reviews will be generic, but there will be some reviews which detail personal experiences under certain conditions. These reviews can tell you if the accessory is going to be suitable for your needs. The limits of paddle boarding are forever getting expanded and now more and more people are going fishing on their SUPs. This is a great way to combine a killer full body workout with all the relaxation and enjoyment of fishing. Paddleboards allow you to fish where regular boats can not go. They also add a flair to an already favorite activity. On your next trip out, try these fishing accessories for an even better day on the water. A relaxing day on the lake followed by a night with some fresh catch, well that can’t get any better. Used any of these fishing accessories? Let us know what you think in the comment section below.